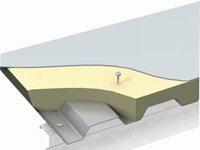 IKO Spectradek is a single component, prefabricated roof panel, consisting of a high performance single ply Spectraplan waterproofing membrane with PIR insulation and a trapezoidal steel deck. Spectradek Prefabricated Roof Panel is suitable for both flat and pitched roofs above 1:80 (0.72°) after deflection, and is also suitable for curved roof applications with a convex curve (45m radius) or concave curve (50m radius). If you want to find out more about the excellent benefits or technical specifications of Spectradek, please email Kevin Bowsher on kevin.bowsher@iko.com or ring him on 07793 577011.